People for the Ethical Treatment of Animals (PETA), the organization that sends scantily-clad women around to demand people stop eating meat, dairy, and eggs (among other things), has a longstanding practice of killing thousands of pets every year at its headquarters “animal shelter.” PETA’s annual report on its shelter killing for 2015—released by the Virginia Department of Agriculture and Consumer Services (VDACS)—shows that despite the efforts of the Virginia legislature, the killing of homeless dogs and cats continues at PETA headquarters. In all, PETA killed 1,456 cats and dogs in 2015, bringing the total PETA has reported killing to 34,970 since records began in the second half of 1998. Those unfortunate victims amounted to 73.76% of the total dogs and cats that entered PETA’s shelter. It’s a very high kill rate by normal measures, but given PETA has killed upwards of 97% of its charges in some years, the toll is low for the animal liberation group. The lower kill rate probably has something to do with the substantial public scrutiny and legislative condemnation that PETA’s “animal shelter” operations faced in late 2014 through 2015. In November 2014, PETA employees dognapped a perfectly healthy and happy Chihuahua (named Maya) from a family on Virginia’s Eastern Shore, and promptly killed it. They left a vegan food basket as an apology. PETA’s “shelter” doesn’t, by any reasonable interpretation of the phrase. Even in the less-kill-y year of 2015, only 3% of the dogs and cats PETA took in were adopted out by PETA. And that has PETA back at the Virginia General Assembly, looking for help keeping its charnel house open. The state legislature punted the matter to the administration (the bill that ultimately passed gave full discretion to VDACS to determine the rules for compliance with the “purpose of finding permanent adoptive homes for animals” law). PETA has been unrepentant about its pet killing, choosing instead to keep the deaths coming with a mixture of spin, lobbying, and poison. 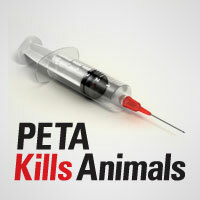 If you want to take action and help put PETA down, head over to our PETAKillsAnimals site, sign the petition to get the IRS to take PETA’s nonprofit status away, and follow PETA Kills Animals on social media.